ORACLE, Ariz. -- Protesters waved "Return to Sender" signs, shoved a group of mariachi musicians and waited for a bus of immigrant children that the local sheriff told them would arrive. At one point, they briefly halted a bus before realizing it was carrying children from a YMCA. According to USA Today, Arizona Rep. Adam Kwasman was among those who thought that the bus of YMCA campers was full of migrant children, tweeting: "Bus coming in. This is not compassion. This is the abrogation of the rule of law." He later deleted the tweet and apologized for the mistake. Last tweet not the bus of illegal immigrant children. Thank God. The bus of Central American children never arrived, ending a day of protest in a small Arizona town that drew more than 100 people on both sides of the immigration debate. Sheriff Paul Babeu is credited with stirring up the anti-immigrant protesters through social media postings and a press release and by leaking information about the migrants' arrival to a local activist. The Sycamore Canyon Academy acknowledged that it had an agreement with the Department of Health and Human Services to take in a "small number" of immigrant children from Central America, but it did not specify how many and when they would arrive. "All this was done in secrecy, and that's where a lot of people are upset," Babeu said Tuesday. "My concern (is) where's the federal government? Why are they not here? Why did they not hold a town hall to answer some of these questions?" He addressed both sides of the protesters, asking them to remain civil, abide by the law and keep the roads cleared. Immigrant rights activists questioned Babeu about agitating protesters when he should be bringing order as the county's top lawman. Babeu said he was simply informing the public and was at the site to make sure the protests on both sides were peaceful. The protests came as the government released new numbers that show how many immigrant families and children have been pouring into the country in recent months. The Border Patrol says 55,420 family members have been caught at the border from October through the end of June, a nearly 500 percent increase from the same period in the previous year. The number includes adults apprehended with their young children, and most of them were caught in the Rio Grande Valley in Texas. In addition, the Border Patrol says 57,525 unaccompanied children have been apprehended through the end of June. The dueling groups in Oracle had a combined 130 people at the peak of the protests, including about 80 rallying against the shuttling of immigrants and 50 in favor. Pro-immigrant supporters held welcome signs with drawings of hearts. Emily Duwel of Oracle said she did not want her town to be misrepresented by what she said was a minority of people who were against the children being housed here. "I'm just concerned about these children who have had to escape worlds of incredible violence," Duwel said. A spokesman for the federal Department of Health and Human Services said the agency would not identify the locations of shelters for migrants to protect their identities and safety. Babeu has generated controversy in the past over his immigration rhetoric. When five bodies were found in a burned-out SUV in his county in 2012, Babeu quickly declared that the killings appeared to be the work of a drug cartel. A few days later, it was learned that it was a murder-suicide of a suburban Phoenix family and not drug-related. A massive surge in unaccompanied children crossing the border illegally began more than a month ago, turning the issue into a major political debate in Washington and in cities across the U.S. In a state known for its strict immigration laws, including SB1070, which many call the "show me your papers" law, attitudes are just as contentious. 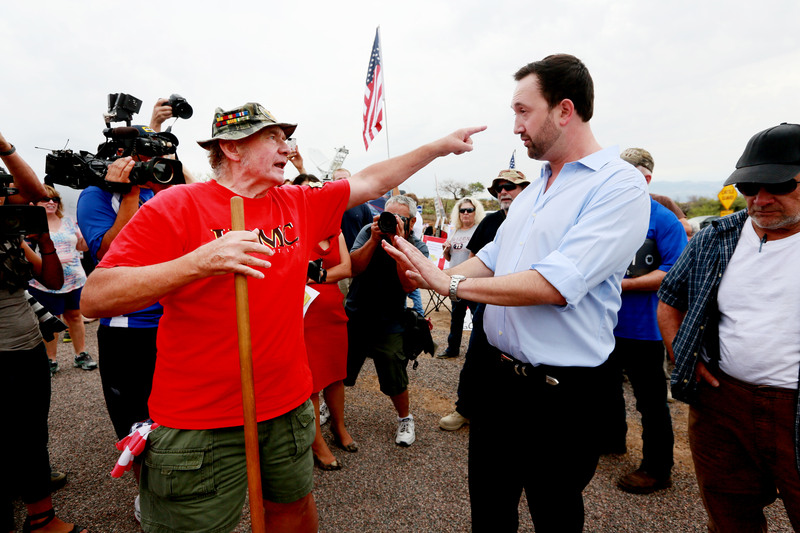 "We are not going to tolerate illegals forced upon us," protester Loren Woods said. The fallout began in late May when reports surfaced that immigration officials were dropping off hundreds of women and children at Phoenix and Tucson Greyhound bus stations after they had been caught crossing the border illegally. Within a week, immigration authorities were flying hundreds of children who had crossed the border into Texas alone to be processed at various immigration facilities.